One of the more common resistances I encounter with new clients is to the issue of drinking water. Many — dare I say, most — do not drink it on a regular basis, if at all. They drink plenty of coffee or tea and Diet Snapple (both hot or iced), and they think that’s water. It’s not. If coffee or tea was water, they’d be spelled w-a-t-e-r.
It’s not about giving up coffee or tea. 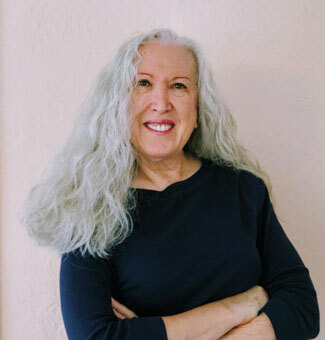 It’s about changing their habits, getting into the routine of drinking water — clear, unadulterated water. 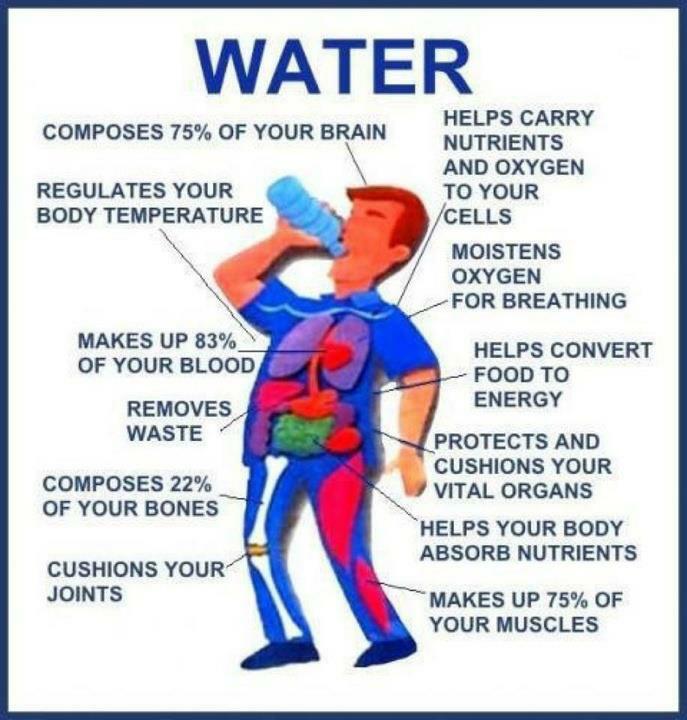 Water has major functions in the body, which is why we’re built with so much of it! 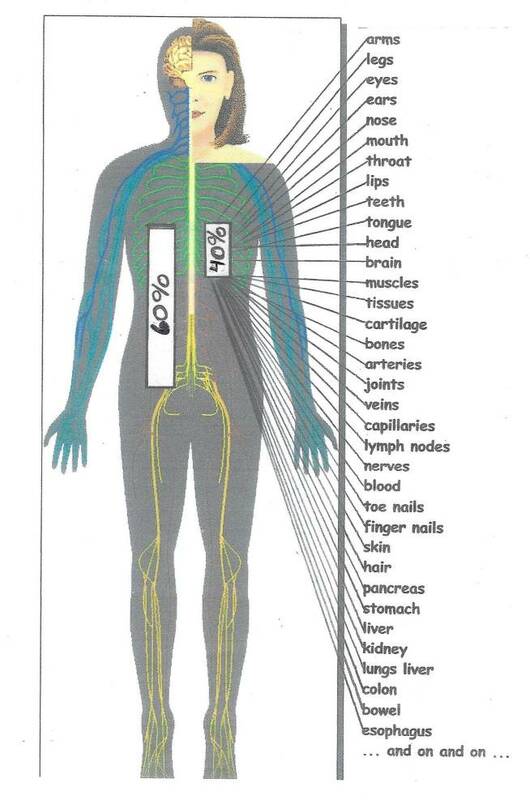 Look at all the parts and processes of the body that need water just to operate at normal levels. Try to picture 100’s of elephants and zebras all drinking at the same watering hole! If it wasn’t replenished by rain on a regular basis, the watering hole dries up. So, aside from what your body needs to operate efficiently, there’s also the water you lose all day long just by regular activity (and not including exercise or working out). All that water has to be replaced, and regularly! 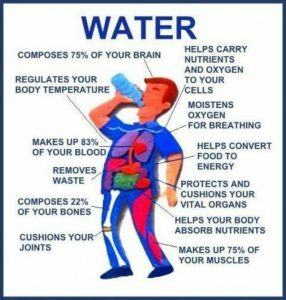 If you don’t drink enough to provide for proper body functions, your body takes water from your brain, blood, muscles and bones to store it. If your brain doesn’t have proper fluid, you get fatigued, have trouble focusing, concentrating, and can become dizzy. If your blood doesn’t have proper fluid, it becomes thick, and your heart has to work harder to pump. That affects your blood pressure. If muscles and bones don’t have proper water, you can get terrible cramping. If your colon becomes dry, you become constipated. Even mild dehydration slows the metabolism, which leads to weight gain. Water weighs. A lot. A large bottle of Poland Spring (50.7 fl. oz.) is the equivalent of 6.5 cups of water, and on the scale it weighs 3.5 lbs! If you’re not peeing it out, it shows up on the scale! It might be inconvenient to have to stop what you’re doing several times a day to urinate, but it’s healthy . . . and necessary to prevent dehydration and bloating (water weight! ).